The mission of the Lower Sioux Tribal Law Enforcement is to protect life & property and preserve the peace through proactive initiatives and methods that best serve the community. The adoption & implementation of the community oriented policing concept and initiatives to promote, encourage, partnerships with individuals, organizations, and entities to address and solve problems that contribute to the social ills that plague our communities. In the spirit of partnership, we will strive to provide the best professional service by maintaining the highest standards in the field of law enforcement to reflect the integrity of our community. To carry out the law enforcement functions and operations of the law enforcement with the goal of preserving the peace, and the protection of life & property by means of enforcing tribal, state, and federal laws applicable within the jurisdiction of the Lower Sioux Dakota community. To respond to emergency calls that are non-enforcement in nature, ex: fire, ambulance, civil disputes, etc…. 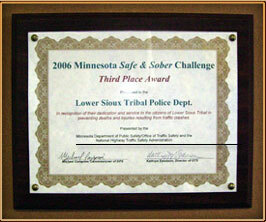 The vision of the Lower Sioux Tribal Police is become a model and recognized leader in the field of law enforcement to best provide the Lower Sioux Indian Community with the best police and protections, thus to safeguard the public with responsive and fair policing that are acceptable to the communities expectations.